The wrath of God is revealed in many different ways. From the immediate and actual consequences of our sin to eternal punishment in hell. 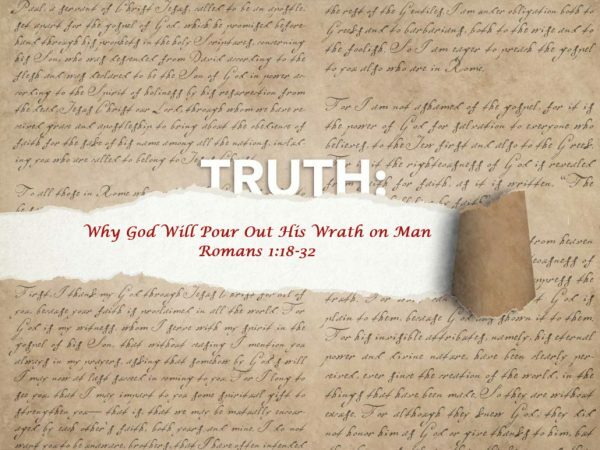 As Paul describes, God’s wrath is also experienced in daily life and in real time events. These events and actions happen to both individuals and societies. Being given over to the “desires of our heart” might not sound like much of a punishment. But when those desires are wicked and sinful, being turned over means being let loose to the full consequences of sin. Sin leads to more sin. Sin is both the cause and the effect. And the depth of our sin when unrestrained is scary. When God turns over a nation or individual, He is pulling back His hand of restraint. His protection is a restraint that keeps us from sinning as completely as we otherwise would. Those who suppress the truth about God and deliberately fail to give honor and thanks, will be allowed to go their own way. This passage of Scripture can be difficult to read or to hear and you can come away from it feeling condemned. But that’s not all together bad. The truth is, under the law system we are all condemned. This is Paul’s point. Another point is that everyone has been given the Law of Creation and God’s Moral Law written on the heart. Trying to concisely convey all the information contained here is difficult. After several attempts I’ve decided to let a more experienced teacher convey these truths. John MacArthur, Minister of Grace Community Church in Sun Valley, CA preached this passage in 2006. He has preached it several times before as well. John does a masterful job working his way through this last half of Romans 1. Keep in mind that he is coming at the passage from the perspective of God’s wrath on a nation. It is important to recognize that the same truths apply to individuals as well. Copyright 2006-2019, Grace to You. All rights reserved. Used by permission.